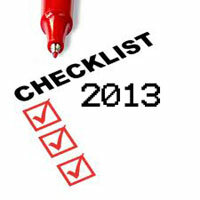 My office wants a checklist of things we should update regarding our SEO efforts moving into 2013. Do you have some feedback on maintenance to-do items that cover our Web site as well as some general auditing tips to cover our link building, social media, and reputation management efforts? Answer: This is a great question and as you head into the New Year it's always a smart policy to do an internal SEO and site audit to plan out your efforts in the coming year. First, if you haven't done so, head over and check out our Professional SEO Web Site Audit Checklist. Update your copyright notice. It just LOOKS more professional. Review 404 error log & fix repeat offenders (make sure to review your site in Google Webmaster Tools as well to identify these errors and others). Review keyword referrals & make sure you have pages constructed and optimized around your more popular combos. Check your competition's backlinks and pick-off the ones you don't have. We recommend Majestic SEO and our own SEN PowerTool suite. Check your social media efforts. Use a site like How Many Shares to track the social signals recorded on your top pages. Seeing lots of "0's?" You have work to do.